During our Halloween week visit to Walt Disney World, we knew we wanted to do something special to celebrate the festive holiday week with our 4 year old. 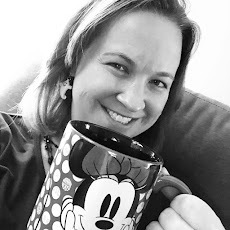 Once we had sticker shock at ticket prices soaring over $100 each for Mickey's Not-So-Scary Halloween Party, we opted to get creative and have just as much with a smaller price tag. 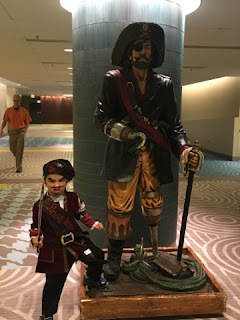 With that in mind, we decided to have a pirate themed adventure day with a visit to The Pirates League in Magic Kingdom and topped off with a sailing on the Pirates and Pals Fireworks Voyage that evening. I've read a lot about fireworks cruises at Walt Disney World before, but had not experienced one myself. I was excited to try a new experience and am equally excited to share that it was a great one! 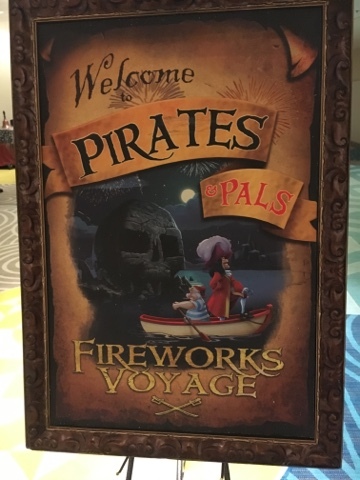 The Pirates and Pals Fireworks Voyage departs most nights from The Contemporary Resort. Sailors of all ages arrive at The Contemporary and are directed to a check-in desk where you get a special bandana to let cast members know that you are cleared for embarkation. While you wait to enter the party, cast members keep the family entertained with coloring stations and a scavenger hunt around the hotel. 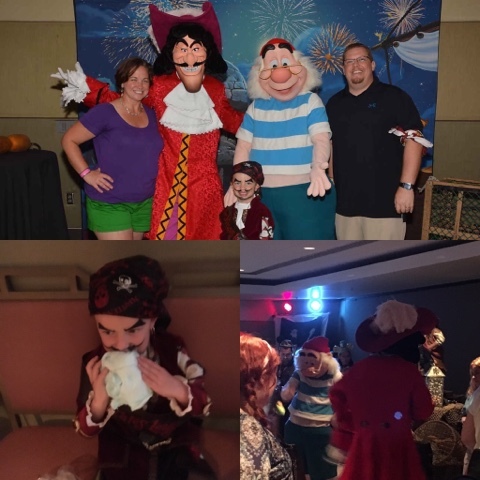 Our festivities were set to begin at 7:45 and right on schedule our pirate host, Patch greeted guests and invited us into a party room. Brody was literally like a kid in a candy store as the desserts were unlimited and the sugar rush was intense. I think his favorite out of the cakes, candy, popcorn, drinks had to be the blue cotton candy - he tried to eat two bags, but we convinced him to save one for later. Which by the way is a fun tip. The food is free and cast members encourage you stock up for the boat ride. While you're busy enjoying the treats, you'll also notice a line forming to meet two of your favorite pirates - Captain Hook and Mr. Smee. The line moves quick and both characters are happy to play and sign autographs. After they are done greeting each party, the characters mingle around with guests (a rare treat anymore in Disney!) and enjoy some time dancing and playing. Mr. Smee even engaged in a sword fight with Brody while they danced to Jake and the Neverland Pirate music. Throughout the party, guests are frequently reminded about the 8:15 departure time to head to the boats and to please use the bathrooms before getting on the boats as there are none on board. Despite these warnings, our son decided he needed to use the bathroom at the absolute last possible minute and we almost missed the boat. Anyway, at 8:15 our pirate host, Patch, and his friend, also named Patch, came back in the room to get us organized. There were two boats that night - the Hook and the Smee. Captain Hook led his boat down to the dock and Mr. Smee did the same. The two waved goodbye as we sailed off in the waters of the Seven Seas Lagoon to get in position for the 9:00 fireworks. During the sailing, Patch led our boat in some getting to know you activities as he greeted each family on board. We were in position right on schedule and the view of Wishes was breathtaking! It may be my new favorite spot to watch the show from as you truly get a sense of how grand the spectacle is from this distance. After the show, the pontoon boat quickly departs to head back to The Contemporary. Patch again leads our crew in a sing-a-long and some pirate games on the way back. Each child leaves the cruise with a small token from the sailing. When arriving back at the dock, Peter Pan is there to greet us. Each guest gets a chance to have a picture with Peter Pan and sign autographs as the night draws to a close. I was disappointed that our pictures with Peter Pan didn't link to our Memory Maker and we couldn't track them down, but we at least have our autograph and memories from the night as well as the other awesome Memory Maker photos too. I loved our night out on the Pirates and Pals Fireworks Voyage. The cost when we went in October was $69 for adults and $41 for children 3-9. Since then, there has been a ticket price increase to $73 for adults and $43 for children. I had no problem at all paying what we did for the cruise and thought the evening was full of fun!